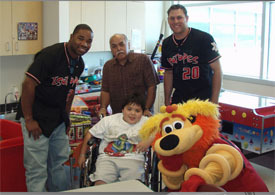 Albuquerque Isotopes outfielder Dee Brown and relief pitcher Dwayne Pollok joined Orbit for a special visit to Carrie Tingley Children’s Hospital on May 27. During their time there, the players toured rooms throughout the hospital’s Inpatient Unit, visiting with patients as well as signing autographs. Orbit, Dee Brown and Dwane Pollok take a photo with a young fan and his father. Tuesday was a picture perfect day for a baseball game. The stands at Victory Field were nearly full for a rare 11 a.m. game. That’s because an estimated 13,000 students from across the state were invited to share in the fun. St. Joan of Arc advanced math students scored a homerun getting to come to Victory Field but, they couldn’t just kick back, they had to compute. “We have to write down their name and write what they do, like, if they get on base or if they get an out,” said seventh grader, Shani Ayers. “It’s a great way, I think, to put math in a real world setting and get a lot of fun out of it too,” said Kahl. The Indians have partnered with the Indianapolis Public School District. The team donates thousands of tickets to the students each year. IUPUI is also a partner and underwrites tickets for students across the state. But the most important numbers Tuesday: Indians 5, Syracuse 4. Salt Lake Bees players Terry Evans, Adam Pavkovich and Brandon Wood left Spring Mobile Ballpark in the dust Wednesday morning for a visit with patients at Shriners Hospital for Children. A temporary home to nearly 20 children with special orthopedic needs, today’s Shriners’ patients ranged from those with spinal cord injuries, broken bones and missing limbs. The Bees players brought in their own rehabilitation for the children, playing catch, shooting hoops, playing ping pong and just plain chatting it up. The near two hour visit was a positive for both the players and the patients. “It was a great opportunity to come up here today. I had fun getting to know the children and their families,” said Wood. The players took photos and left autographed photos with the children. Brandon Wood enjoyed visiting with patients at Shriners Hospital. On Tuesday afternoon, two local middle school teams from Prince William County took to the field to live out one of their lifelong dreams of one day playing their favorite game on a professional baseball field. That dream was realized when St. Thomas Aquinas Regional School took on Manassas Christian School in front of hundreds of family and friends from G. Richard Pfitzner Stadium, the home of the defending Carolina League champion Potomac Nationals. As an added bonus, the participating players got to watch some of their favorite P-Nats players prior to their game as the Nationals hosted the Salem Red Sox in a Business Persons’ special that featured an 11:00 a.m. start time. Aquinas jumped out to an early lead scoring a 1st inning run and the score would remain 1-0 until the bottom half of the 4th. The bats then came alive for Manassas Christian as they scored eight times in that frame and wound up pulling away with an 8-2 victory over their neighbors from Woodbridge. In the end, the final score wasn’t the most important set of numbers that were posted on the scoreboard. 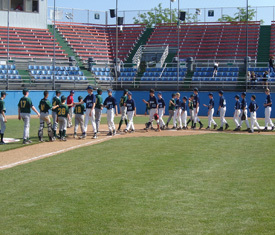 As part of a fundraiser set up by each institution, the players involved sold a total of 250 tickets (125 each) to their loved ones so that they could share in the experience of seeing their sons and daughters play our national pastime on the same field where future Nationals’ all-stars are born. The Potomac Nationals offer several ticket deals that accommodate groups of 20 or more. P-Nats Ticket Fundraisers are an excellent way to generate revenue for your non-profit organization. Organizations such as Little Leagues, civic organizations, churches, schools and charities will enjoy great benefits such as: video board and public address recognition, group names printed on tickets, and at least 50% profit on each ticket sold. For more information, call (703) 590-2311. The Charlotte Stone Crabs baseball team raised $2,400 for the Susan G. Komen for the Cure foundation after auctioning off their game-worn, pink jerseys to promote breast cancer awareness during Friday’s game at Charlotte Sports Park. The Stone Crabs partnered with Advanced Imaging of Port Charlotte to put on the “Pink in the Park” event in which Stone Crabs players traded their usual white home jerseys for pink versions in an effort to promote breast cancer awareness as they defeated the Fort Myers Miracle and claimed first place in the Florida State League South division. Every jersey from the team was sold during the in-game auction, including the highest individual jersey for $200 and a team-signed jersey for $375. All proceeds from the auction benefit the Susan G. Komen for the Cure foundation which is the world’s largest grassroots network of breast cancer survivors and activists. For more information on the foundation, please visit ww5.komen.org.